Bill Reagan boasts decades of experience and football expertise. 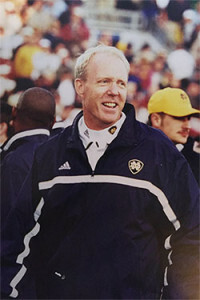 Former University of Notre Dame Football staff member, Bill Reagan, founded Top Gun Quarterback Training in 2003. 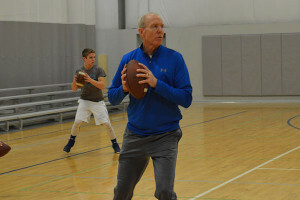 Reagan’s NCAA football coaching history and passion for the quarterback position coupled with his knowledge of passing mechanics and footwork inspired him to create an academy to mentor quarterbacks. Reagan has trained over 150 quarterbacks. 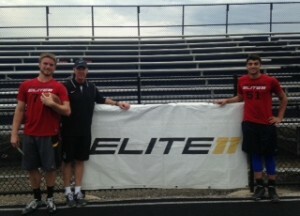 The past five years saw over 24 high schools from four states start quarterbacks who have trained with Top Gun. Five of Reagan’s recent clients are currently on collegiate football rosters. In addition Reagan serves as a member of former NFL Quarterback and current ESPN analyst Trent Dilfer’s renowned Elite 11 coaching staff, working with ESPN “Game Day” Quarterback Analyst George Whitfield and one of Bill’s first Top Gun clients, former NFL QB Charlie Frye. Reagan is the current camp director for Ohio State Assistant Head Coach Tony Alford’s youth football camp in Park City, Utah. Bill has served on summer quarterback coaching staffs for the University of Notre Dame, University of Michigan, Youngstown State and Miami University. In 2009 Reagan coached with coaching legend Lou Holtz for the Notre Dame Japan Bowl. Reagan also secured the assistance of former national championship quarterback Tony Rice, in creating the Reagan & Rice (free) QB/Receiver Camp. Reagan joined Notre Dame in 2001 as Director of Football Operations working for head coaches Bob Davie and Tyrone Willingham. Prior to Notre Dame, Reagan spent six years as the Offensive Coordinator at NCAA Division II power, Ashland University and before that was the head football coach at his alma mater, St. Joseph’s College. Reagan spent ten years at the helm of St. Joseph’s and gained a reputation as an offensive innovator and developer of quarterbacks. As a sophomore quarterback, Reagan guided St. Joseph’s to the Indiana Collegiate Conference Championship for the first time in 14 years. In his senior year he was voted to the Outstanding College Athletes of America, as well as the Indiana Collegiate Conference All-League Team. Reagan set career records for: passing touch downs, completion percentage and passing yards as well as tying the record for touchdown passes in one game which he did on two occasions. Reagan was inducted into St. Joseph’s College Athletics Hall of Fame as well as the Lorain County Hall of Fame in the spring of 2005.